Upgrading to an efficient heating system can save a lot of money and reduce greenhouse gases. Soon, you’ll start seeing your energy bills start to rise each month because of the cold weather. That’s never fun. But, you might be paying a lot more than necessary to heat your home. We decided to look into whether a new efficient furnace adds up to much in the way of energy savings. First, how old is your heating system? Some homes have furnaces that are twenty years old or even decades older. Kevin Shoemaker of Shoemaker Heating and Plumbing is getting ready to replace a furnace installed nearly 50 years ago. 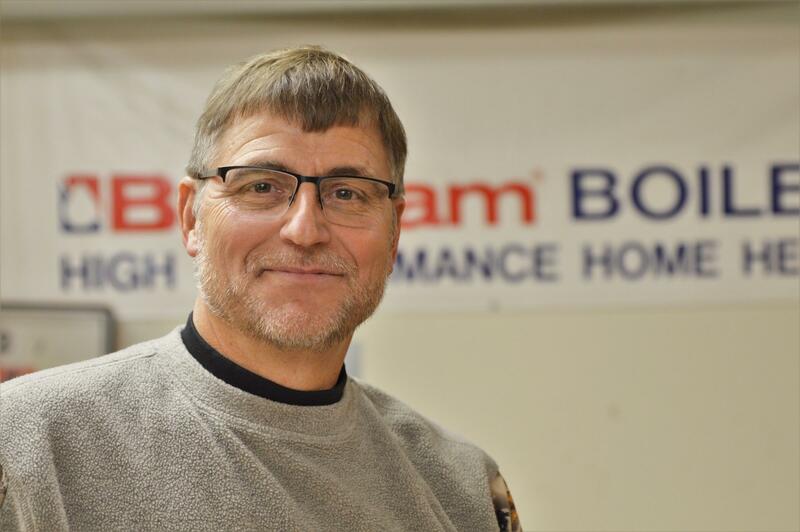 Kevin Shoemaker with Shoemaker Heating and Plumbing in Palmyra, Michigan. “I’ve been in the industry since 1977 and the piece of equipment I’ve quoted and going to change out was old when I started in the industry. Their energy savings will easily be 40%,” Shoemaker said. Here’s why the energy savings is that high. It starts with something called the Annual Fuel Utilization Efficiency. AFUE basically tells you, as a percentage, how much of your fuel goes to heat your house and how much just escapes through the vent pipe. Older units are not efficient. “The AFUE on those would be somewhere in the 60 to 65% (range),” Shoemaker explained. That means up to 40% of the fuel is wasted. “However, most of the products that are sold and installed today range from the 95, 96, 97% efficiencies,” he added. That’s just the beginning of it. New technology uses two-stage burners and air-handling systems to more efficiently blend the heated air. Instead of the heat-it-up, cool down, kick on full blast again, it means a more steady temperature in the house. More efficiency. Also reduced greenhouse gases. But does it really save that much? We stopped by Jerry Beagle’s house, one of Shoemaker’s customers. His heating system, installed in 1970, quit on him. Jerry Beagle finetuned his unit to his comfort. Saving close to 40% on his energy bills, he wishes he replaced the old boiler years before. “Last year, about three weeks before Christmas, our boiler developed a leak. And, I tried to fix it the way I normally had fixed it. And then, all of a sudden one night the pan down below flooded,” Beagle said. The leak was beyond fixing. The weather was cold, down in the twenties. He called Shoemaker to see what his options might be. He had a two-stage unit installed that not only heated the water that circulated through the baseboard heaters, it also more efficiently heated water for the faucet. So, he basically replaced his hot water heater and his home heating system with one unit. It was colder last year. His fuel supplier says on average, homes in the area used 15 to 20% more propane than the year before to stay warm. Beagle used 15 to 20% less. He says that's quite a difference. LG: What do you think of that? The lesson is this: if your furnace is one of those energy wasting units, it could make sense in the long run to replace it before you have to. But a new furnace or boiler can cost anywhere from a few thousand dollars to several thousand. Kevin Shoemaker says most people feel that’s a cost beyond their reach. “Sixty percent of the people that need a replacement don’t have means to pay for it,” he said. A program called Michigan Saves was created by the state government. It put up money to guarantee loans from credit unions for people with a steady income and credit rating of 640 or above. “This is an unsecured loan at 4.99 percent APR for residential customers and consumers. That’s unheard of,” said Selma Tucker, spokesperson for Michigan Saves. Often an unsecured loan has interest rates of 17% or higher with a credit score of 640. Those loans can be used for heating systems, insulation, and other weatherproofing. There’s another financial break. Many of Michigan’s utility companies offer rebates when a homeowner insulates or puts in an efficient furnace or boiler. Sometimes the money runs out on those programs, so it’s good to check with your utility ahead of time.